Kathy Valente (left), co-owner of Small Wonder Gallery in Camden, helps customer Liz O'Loughlin find an etching. O'Loughlin, who is visiting the East Coast from her home in Australia, is staying with a friend in Belfast. Willy Reddick, one of five artists who own and operate Aarhus Gallery in Belfast, said her group is committed to showing good art, regardless of whether it sells. 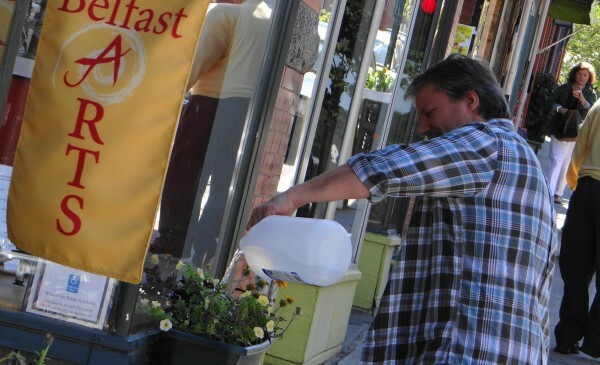 Charlie Dufour, owner of Galerie Dufour in Belfast, waters plants in window boxes of his Main Street gallery. Though Belfast's streets were crowded this summer with tourists, Dufour's sales were down from other years. BELFAST, Maine — Art — ranging from greeting cards with images of lighthouses to original paintings and sculptures with four- and five-figure price tags — is an important commodity in Maine’s coastal towns. 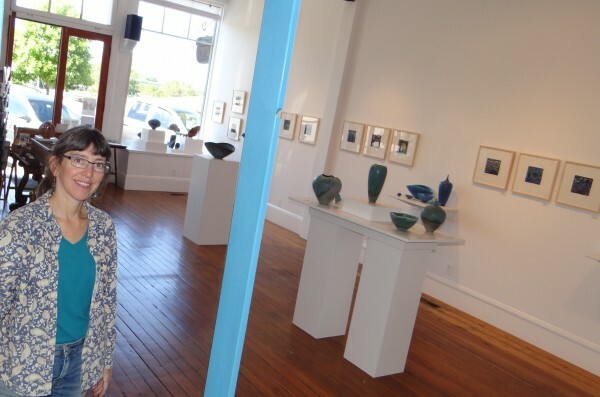 The art galleries that line the main streets of Thomaston, Rockland, Rockport, Camden and Belfast have become an integral part of the region’s brand and economy, notes Robin McIntosh, membership services manager for the Penobscot Bay Regional Chamber of Commerce. But they also are, in essence, art stores, and must sell enough to pay the rent and turn a profit for the owner. In Thomaston, the Haynes Galleries sells original work by the Wyeths, Winslow Homer and John Singer Sargent, with prices that reflect the vaunted place those names hold in the art world. Owner Gary Haynes, who also has a gallery in Nashville, applies a serious, diversified marketing strategy to bring buyers into his businesses. In Camden, the Small Wonder Gallery sells representational art, much of which evokes the beauty that tourists find on the Maine coast. For nearly 30 years, Kathy Valente, who founded the gallery with her husband, Michael, has observed what sells, and it’s often art that is accessible. The family-run gallery closes from mid-February through March, acknowledging that the summer tourist traffic is what drives sales. And in Belfast, the Aarhus Gallery sells work by the five artists who opened the gallery and by artists whose work they like. It is, in a very real sense, art for art’s sake. The founders have to pitch in money from their other jobs from time to time to pay the rent. Art galleries, then, are as different from each other as a diner is from a gourmet restaurant. Some represent a slew of artists, others just a few, and still others are what one owner calls a “vanity gallery,” representing only the owner’s work. Typically, galleries retain 40 percent to 50 percent of the sale price, with the remainder going to the artist. The second type are art lovers, those who “work at enjoying and seeing and thinking about art.” They visit galleries regularly and may collect the work of particular artists. Charlie Dufour, a fine-art photographer whose work is nature-based still lifes and female nudes, thinks a lot about art and its place in the market. He believes he has found a niche different from what might be found in other galleries, and believes he has a stylistic consistency buyers are beginning to recognize. There’s nothing wrong with pretty paintings of lighthouses and sailboats, Dufour stressed. It’s just not what he wants to produce; besides, he said, that art can be found at many other places. A few years after he opened his Galerie Dufour on Main Street in Belfast in 2003, “My sales were incredible.” Yet this summer, when many downtown business owners report more tourist foot traffic than any summer in memory, Dufour’s business has been slow. “The economy is bad, yeah, but it’s really about attitudes,” he said. Art is not a necessity, he acknowledged, but it can be pleasing in profound ways and continue to hold that power over time. Dufour intentionally puts some of his female nudes in one of the two street windows so visitors know what to expect when they come inside. Still, some parents hustle their children out when they see the nudes, a source of frustration for the artist. “I do very traditional nudes,” he said. “The masters were doing the same sort of things with paintings. It’s not edgy at all. There is no attempt in my work to arouse the viewer. If you’re not enlightened to art, then all you see is ‘naked people,’” he said. Most of his sales are to women, he noted, with prices ranging from $25 for a 5-by-7 print to $475 for a framed larger work. Dufour has a theory about the state of the business. In 2005 and 2006 sales were strong, which coincided with the housing boom. When people are moving into new or different houses, they want to decorate walls. With the housing market stagnant, there are fewer blank walls, he said. Dufour teaches psychology at the University of Maine, giving him another income stream that helps keep his creative life afloat. Aarhus Gallery’s five artist-owners feature their work in each of the Main Street gallery’s shows. They also feature the work of some 20 other artists whose work they like, and organize shows around themes such as “love,” “the color red” and “chaos,” said Willy Reddick, one of the five partners. The gallery retains 40 percent of sales, but just 30 percent from the partners. Even so, “We still struggle to pay the rent,” she said. All the partners have other sources of income. The gallery features an unusual wooden swing in the middle of the floor, and often when it’s Reddick’s day to mind the gallery, she will be swinging when people walk by and look in. “We beckon them in,” she said, because the partners want people to see and be moved by the art, even if they don’t buy. But it’s not all struggle. The Small Wonder Gallery’s Valente said sales were strong this summer. Eighty percent of sales come from June to October, she said, with prices ranging from $10 to $3,100. Haynes, whose Thomaston and Nashville galleries specialize in nationally known artists working in the American Realism tradition, sees his location as a must-stop for area visitors. “We’re an art destination,” he said, with visitors touring the Farnsworth Art Museum in nearby Rockland then visiting his gallery on their way down one of the area’s scenic peninsulas. 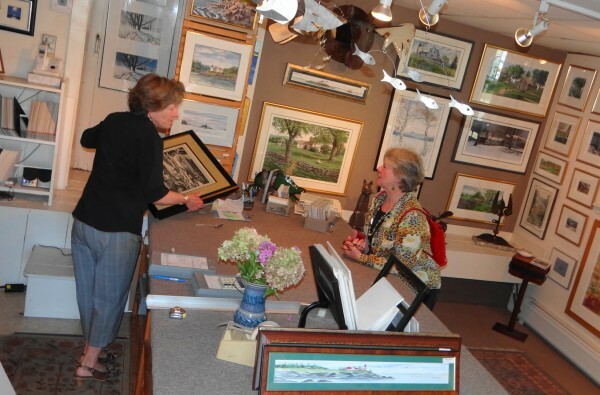 The Pen Bay Chamber’s McIntosh notes that galleries “are an attraction to our Main Streets for both locals and tourists.” Gallery visitors do more than peruse art, she said. They also shop in stores, eat in restaurants and buy gas in local stations.